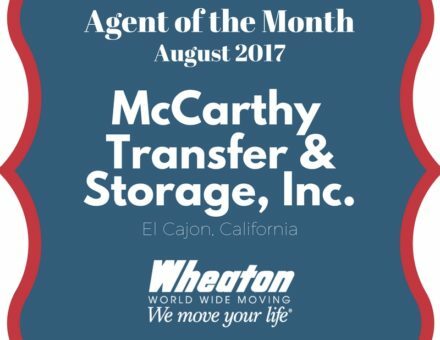 EL CAJON, CA – McCarthy Transfer & Storage, Inc. of El Cajon, Calif., is Wheaton’s Agent of the Month for August 2017. McCarthy Transfer was established in 1919 and is now owned and operated by the third generation of the McCarthy family. McCarthy Transfer joined the Wheaton system in 1994. McCarthy Transfer was established in 1919 and began hauling goods by horse and wagon from the La Mesa Train Depot to East County. They now serve customers’ needs from the San Diego area to all over the world. We offer several moving solutions to make your moving experience as easy as it can be. They are a local, family-owned, full-service professional company with years of experience in residential and commercial moving. You can find McCarthy Transfer & Storage at 1386 Fayette Street, El Cajon, California 92020. They can be reached by phone at (800) 896-2594 or online at http://www.mccarthytransfer.com/.